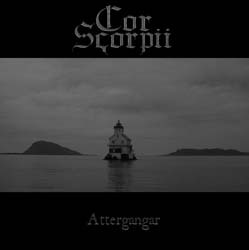 Cor Scorpii is a new band formed by Windir keyboard player Gaute Refsnes. "Cor Scorpii" means "Heart of the scorpion". Cor Scorpii, a different designation for "Antares", is the brightest star in the constellation Scorpius. After Ulcus and Windir joined forces, Refsnes continued making music with a somewhat different approach, resulting in plans of a project of his own. However it wasn't until the tragic death of Windir founder Terje "Valfar" Bakken and the following farewell concert, Cor Scorpii arose with a complete line-up. The band currently consists of six members. Gaute Refsnes, Stian Bakketeig (lead guiter) and Jørn Holen (drums, currently also in Vreid) have all been part of the renowned bands Windir and Ulcus, while Rune Sjøthun (rythm guitar) and Inge Jonny Lomheim (bass) have been a part of the local metal scene for a long time. The line-up is completed by the hellish screams and presence of Thomas S. Øvstedal. Jørn Holen later on quit the band in order to focus fully on Vreid. New man behind the drums is Ole "Vargon" Nordsve. Musically, Cor Scorpii incorporate different styles with emphasis on melodies and aggression. The music has some influences from both classical and folk music, combined with the atmospheres of Norwegian extreme metal. The lyrical concept deals with the darker sides of existence and the human mind. The band has released one demo called Attergangar. All four songs on the sold-out demo can now be downloaded for free from the official website. Cor Scorpii will enter Top Room Studio in July/August 2007, to record their full-length debut album. The album will be released at the end of the year.